Image may be graphic. Hover to view. 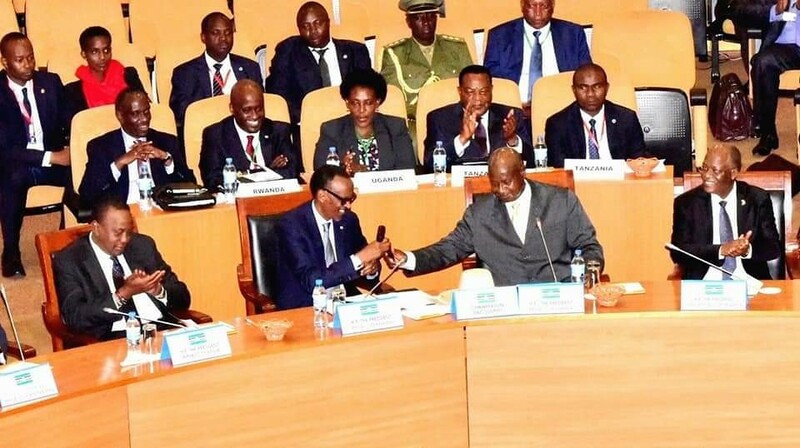 November was dominated by international focus on the situation of Burundi but with very few results as Burundi government boycotted the EAC Summit. 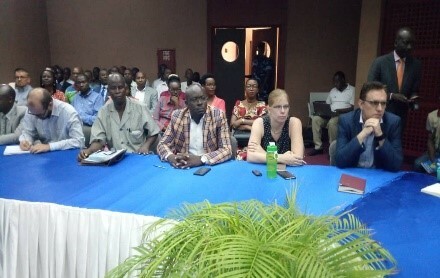 However the arrest of former officers in the Army of Burundi and the release of an arrest warrant against a dozen of dignitaries including President Pierre Buyoya raised much concern as to the ethnicization of the conflict and as a strategy to escape the real political crisis prevailing in the country. Meanwhile, killings and arbitrary arrests continue with more dead bodies recovered. 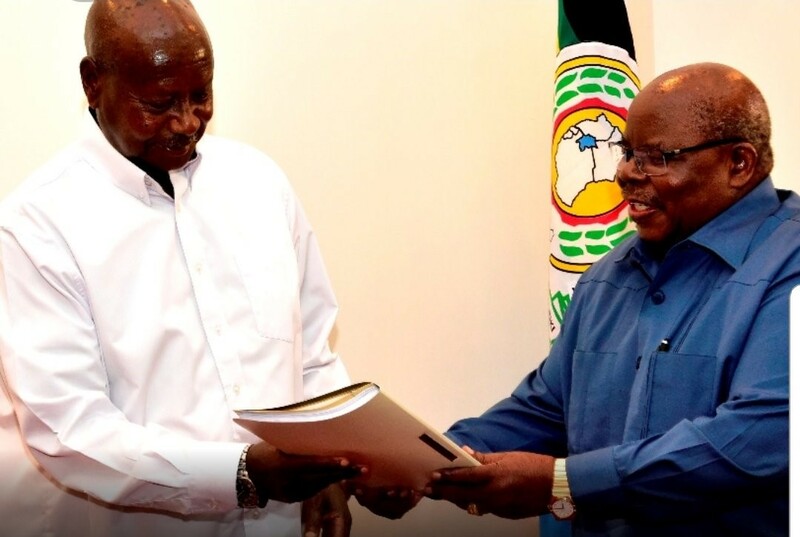 After the absence of the government of Burundi to the 5th and last inter-burundian dialogue in late October, the facilitator, President Mkapa presented his report to the Mediator President Museveni on 19 November 2018. 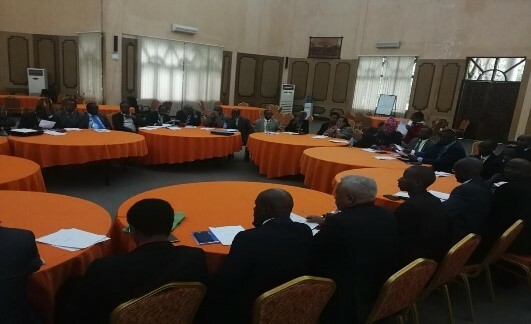 While many expected that the report would be analyzed by the Summit of 30 November 2018, the government of Burundi argued that it was notified at short notice and would not be able to prepare responses, despite the chair of the Summit insisting. The Summit was finally postponed to 27 December 2018 due to the failure to have the required quorum. Meanwhile, the AU peace and security council reiterated the deployment of human rights and military observers whereas the UN Special envoy Kafando stressed the fragile situation as he presented his report in the United Nations security council. Since gaining independence Burundi experienced several crises. The assassination of a Hutu President Melchior Ndadaye on 21st October 1993 triggered the massacre of thousands of Tutsi and Hutu members of UPRONA days after. The atrocities were documented by a commission set up by the United Nations Security Council that concluded to the commission of the crimes of genocide committed by the FRODEBU against the minority Tutsi. The international community helped Burundi to peacefully settle the political crisis and put an end to violence. The peace process concluded with the Arusha peace agreement in 2000. 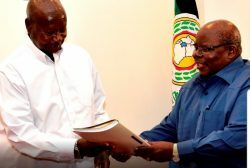 The latter granted provisional immunities to both army members and former rebels until the creation of a special tribunal for Burundi and the creation of transitional justice mechanisms. Although this step was not reached, and amid the unsolved crisis related to the third term of President Pierre Nkurunziza, the Ndadaye assassination case was recently revived. On 25 November 2018, 4 high ranking officers who retired from the army namely General Ndayisaba Celestin aka kibadashi, Colonel Gunungu, Colonel Niyonkuru were arrested and detained in several prisons of Burundi. Less than a week later, 18 people, majority of whom were in the leadership of UPRONA in the 90’ were placed under international arrest warrants. In a press conference of 30 November 2018, the prosecutor general of the Republic, Sylvestre Nyandwi stated that all countries hosting the concerned people should hand over those wanted to Burundi justice. President Pierre Buyoya currently Special envoy of the African Union in Mali is listed first whereas former president of Uprona including Charles Mukasi and Libere Bararunyeretse and Luc Rukingama are amongst the 18 persons wanted. During the month of November 2018, several administrative units released notes recalling the obligation to contribute for the general elections of 2020. In the beginning, the contributions were presented as voluntary because the Minister of Home affairs and that of Finances signed a joint ministerial ordinance n° 530/540 /1772 of 11 December 2017 relating to modalities of contributions. During the period between 11 and 14 November 2018, eight (8) dead bodies were recovered in Lake Rweru situated in the province of Kirundo. On 11 November 2018, fishermen were surprised as they discovered two male bodies floating on the waters of the lake Rweru. They quickly called the local authorities. The chief of the District of Busoni Marie Claudine Hashazinka ordered the burial of the dead bodies without identifying them. The corpses were buried in the cemetery of the Rukurajoro sub hill and Gatare area three hundred meters from Lake Rweru. Two days later, on 14 November 2018, two dead bodies of male adults were recovered floating on the lake peninsula at Nyagisozi hill in Busoni District. The same day, four other corpses of two children, a man and a woman who, probably could be a family, were found all naked, tied on a tree and beheaded. Again, the chief of District ordered the burial of the corpses without prior identification. 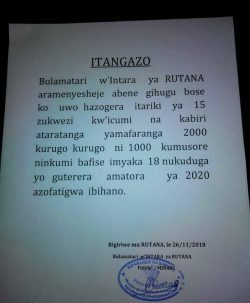 On 25 October 2018, a 30 years old male Richard Nkurunziza was arbitrary arrested by Imbonerakure Gaposho and three policemen assigned to the police station of Bubanza and taken to an unknown destination. On 30 October 2018, a dead body of an unidentified man was recovered hung in a palm plantation at Kirama hill of the District of Buyengero. The victim bore traces of blows on the body, and was undressed by his executioners. On 5 November 2018, A pro- Rwasa militant, Elvis Ndayirukiye was gravely assaulted by Imbonerakure militiamen at Rusagara hill in the District of Mugina because he was accused of holding an unauthorized meeting. On 5 November, teachers at secondary school of Gisovu, Bukuru Emmanuel aka Bekere and Abraham Hashiminfura were gravely assaulted and wounded by a team of Imbonerakure of Bubanza led by a certain Eric. Hashiminfura lives with a disability. On 7 November 2018, a 12-year-old girl I.N. was raped at Mugerama Hill, in the District of Nyanza Lac Commune, Makamba Province (South of the country), on 7 November, 2018. Relatives report that she attempted to call for help, but her abuser had already committed the irreparable. On 9 November 2018, a soldier shot dead one of his colleagues and seriously injured another before killing himself on Kinyovu hill, Ntega commune. Witnesses report that the perpetrator of the shooting, nicknamed Mafume, was disputing with a military colleague assigned to the same barracks on Kinyovu threatening his colleague with his weapon. A third soldier, Gervais Rugemintwaza (nicknamed Biregeya) tried to intervene to reconcile his colleagues. He was immediately shot by Mafume. The witnesses report that the latter also fired on the colleague with whom he had a disagreement, before killing himself. 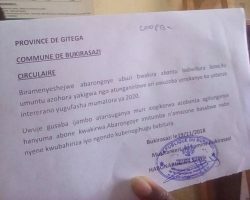 On 13 November 2018, a magistrate of the Tribunal of Bururi, Nicaise Niyungeko was abducted from his office without explanations or a warrant. A day later, he was put under arrest and detained in Mpimba. On 16 November 2018, a 62-year-old Symphorien Ngendakumana was killed by unidentified individuals at his home situated at Buhoro hill in the District of Mabayi. Witnesses reported that the body of the victim had traces of wounds. Witnesses also report that the practice of witchcraft is at the origin of this assassination. Contribute: Africa Atrocities Watch is a crowdsourcing platform. Submit a report or personal account. Martha Bakwesegha-Osula joins AWA with over 15 years of experience in advocacy, policy development and analysis. Having previously worked with Crisis Action as Nairobi Director responsible for leading the Organizations advocacy and strategic engagement with the African Union (AU). Prior to that she worked with the African Centre for the Constructive Resolution of Disputes (ACCORD) in Durban, South Africa working on peace-building programmes in Angola, Liberia, Burundi and the DRC. She has worked on governance and policy related programmes at the Development Policy Management Forum (DPMF) in Addis Ababa, Ethiopia. She holds a Masters degree in Public Policy from the University of Natal, Durban, South Africa (University of KwaZulu Natal) and a Bachelors Degree in Political Science from Rutgers University in New Jersey, USA and a certificate in International Studies from the same University. Sandrah Akello handles Atrocities Watch’s Finance and Administration. She has a wealth of knowledge and experience starting with her time at UNICEF doing archiving. She boasts of experience in the field of finance and management amounting to over 10 years. She holds a Bachelors’ degree in Environmental Management and certificates in project planning, grants management and finance for non-finance managers. Daniel Christopher Odaka is a graduate of Makerere University Business School with an Honors degree in Bachelor of Business Computing, he understands the need to create bridges through media and with the use of technology. Right after school he joined the New Vision Newspaper where he was a Social Media manager not long after that joined the world of NGOs and started to work with RTI International and worked with the DREAMS project whose goal was to reduce new infections on HIV among the youth. After close to a year there he joined Atrocities Watch and revived his Social Media knowledge applied to then overall communication department of the organization. Africa Atrocities Watch encourages interns who value the core ethos of the work and values of ending mass atrocities and holding people accountable for their roles in the commission of such atrocities. Dr. Albaqir Muqtar is currently the Director of al-Khatim Adlan Centre for Enlightenment and Human Development (KACE). Until October 2006, he was a Senior Fellow with the US Institute of Peace (USIP) researching identity and conflict in Sudan. Prior to that, until September 2005, Dr. Muqtar was the Regional Campaign Coordinator for the Middle East and North Africa in Amnesty International’s London office. He has taught linguistics and Middle Eastern studies. He holds degrees in Linguistics from University of Khartoum (BA 1984, MA 1988), Aston University (Msc 1991), and in Middle Eastern studies from Manchester University (PhD 1997). He taught Middle Eastern Studies at the Manchester Metropolitan University (MMU) (1997-2001). In 1999, Dr. Muqtar was a research fellow at both University of Ghana-Legon and Northwestern University where he focused on the philosophical underpinnings of Sudanese identity and the civil war. Dr. Muqtar has worked in different research settings; academic, as in University of Jazira and MMU, as well as think tanks, where strategies and research are policy and action oriented, as in Amnesty International. In both of these capacities, he undertook supervisory roles. Dr. Yitiha Simbeye Zinazile is a Lecturer in Law with the Open University of Tanzania (OUT) in Dar es Salaam and a specialist in International Criminal Law. Also, she is the current coordinator of the Masters in Law in International Criminal Justice (LLM ICJ). Previously, she was Head of the International & Constitutional Law Department from 2008-2011. Prior to that, she served as Duty Counsel with the International Criminal Tribunal for Rwanda (ICTR) on the Bizimana Special Deposition Hearing (2011-2012) and Defence Legal Assistant on the Ngeze Appeal (2006). Dr. Zinazile was Dean of the Faculty of Law at Makumira University College of Tumaini University, and the first female Dean in Faculty of Law in Tanzania, between 2004-2006. Prior to that, she was a Teaching Fellow at the University of Warwick in the United Kingdom. She has published on questions of international criminal law, with a particular focus on immunities of state officials. Dr. Zinazile has a Ph.D. in law from Reading University in the United Kingdom, an LLM from King’s College, London, and an LLB from the University of Warwick, UK. She published the book Immunity and International Criminal Law, (Ashgate, 2004) and is an active and life member of the Pan-African Lawyers Union. Therese Niyondiko is a women human rights activist and an independent consultant, with more than 15 years of professional experiences both in international organisations and NGOs, working on project management and gender mainstreaming within development policies and programs. Until recently, she worked as a Senior Programme Officer at UNEP/Division of Environmental Policy Implementation. There, her responsibilities included coordinating the Poverty-Environment Initiative’s (PEI) donor relations, facilitating resource mobilization, and providing technical support to regional and country programs, with a special emphasis on gender mainstreaming and poverty reduction. Ms. Niyondiko has also worked with the International Conference on the Great Lakes Region (ICGLR), focusing on gender mainstreaming in Great Lakes development programs and policies under the ICGLR Pact on Security, Stability, and Development. She particularly worked on promoting the ICGLR Protocol on the Prevention and Suppression of Sexual Gender Based Violence Against Women and Children in the region and it’s related Kampala Declaration on Prevention, Ending Impunity and Providing Support to SGBV victims. She previously led and managed the Executive Secretariat of the African Women’s Development and Communications Network (FEMNET), a pan-african women’s network working on advocacy for gender equality and women’s empowerment. During her professional career, critical components of her work have been strategic planning, engendering regional and international development processes and policies, facilitating training workshops, advocating for justice and human rights, monitoring and evaluation, and mobilizing resources from a diverse range of donors (International NGOs, UN agencies, Foundations and other grant making organisations). Ms. Niyondiko holds a Masters Degree in Communications Management from Coventry University’s School of Engineering in the UK, a Bachelor of Arts in Agricultural Economics from the University of Burundi, and a Diploma in Peace and Security in Africa from Uppsala University in Sweden. She is Burundian, and has excellent communication abilities in French and English. Agnes Ebo’o is the founder of the Citizens Governance Initiatives in Cameroon, a nonprofit association that promotes accountability and citizens’ participation in governance by using international law (including the African system), constitutionalism and constitutional rights as well as national laws as the foundation of its work. A pioneer in the promotion of freedom of information and open government in Cameroon, she has been involved in the creation of several regional initiatives that promote open government and the rule of law in Africa. Dr. Godfrey Musila holds a Ph.D in International Criminal Law and Justice (with a focus on the international criminal court) and a Masters degree in International Human Rights Law. He is Senior Lecturer at the University of Nairobi’s School of Law, where he teaches Constitutional Human Rights and International Criminal Law. He is also Adjunct Professor at Open University of Tanzania where he lectures on OUT’s LLM in International Criminal Law and Justice. Dr. Musila has previously served in the capacity of Director of Research & Policy and Senior Researcher on Kenya’s Truth, Justice, and Reconciliation Commission and the African Union’s Commission of Inquiry on South Sudan respectively. He has written and published widely on human rights, international criminal law & justice, and transitional justice experiences in South Africa, Mozambique, Kenya, Uganda, Rwanda, Sudan and DRC. Dr. Chidi Anselm Odinkalu is the Senior Legal Officer for the Africa Program of the Open Society Justice Initiative. He is a lawyer and advocate from Nigeria and also currently chairs the Governing Council of Nigeria’s National Human Rights Commission. Dr. Odinkalu received his Ph.D. in law from the London School of Economics and Political Science. Prior to joining the staff of Open Society Justice Initiative, he was Senior Legal Officer responsible for Africa and Middle East at the International Centre for the Legal Protection of Human Rights in London, Human Rights Advisor to the United Nations Observer Mission in Sierra Leone and Brandeis International Fellow at the Centre for Ethics, Justice and Public Life of Brandeis University, Waltham, Massachusetts. Dr. Odinkalu is widely published on diverse subjects of international law, international economic and human rights law, public policy, and political economy affecting African countries. He is frequently called upon to advise multilateral and bilateral institutions on Africa-related policy, including the United Nations Economic Commission for Africa, the African Union, the Economic Community of West African States, and the World Economic Forum. Dr. Odinkalu has extensive networks across Africa that have been built up over several years of working for human rights and social justice on the continent. He is associated with several non-governmental and academic institutions within and outside Africa. Among other affiliations, he is a member of the Human Rights Advisory Council of the Carnegie Council on Ethics and International Affairs, of the Boards of the Fund for Global Human Rights and of the International Refugee Rights Initiative. He is also the founder of the Section on Public Interest and Development Law (SPIDEL) at the Nigerian Bar and member of the Executive Committee of the Nigerian Bar Association. Brian Kagoro was previously the Regional Programme Advisor for the UNDP’s Africa Governance and Public Administration Programme as well as Officer in Charge (ad interim) of the UNDP Africa Governance Team. A constitutional lawyer by training, he practiced law as partner at Kantor and Immerman, one of the leading law firms in Zimbabwe. He was instrumental in the formation of several civil society groups, including: the National Constitutional Assembly; the NGO Human Rights Forum; Crisis in Zimbabwe Coalition; and the Centre for Citizen Participation in the African Union (CCP-AU). Mr. Kagoro has served on boards of both private sector and civil society groups, including: National Foods Ltd, Workers Trust, Amani Trust, CCP-AU, Action Aid International Ghana, and Zimbabwe Lawyers for Human Rights. In 2002, he became the Founding Director of the Crisis in Zimbabwe Coalition and was subsequently elected chairperson of the Crisis Coalition. In 2005, Mr. Kagoro was appointed Pan-African Policy Manager for Action Aid International, an international anti-poverty development agency headquartered in Johannesburg, South Africa. He has served as a Consultant for several Regional Organizations, including the African Union Commission (AUC), NEPAD Planning and Coordination Agency, and United Nations Economic Commission for Africa (UNECA). Jane Serwanga is an Advocate of the High Court of Kenya. Until 2012, she served as the Deputy Executive Director and Head of Programmes – Federation of Women’s Lawyers (FIDA) Kenya. She is presently based at Equality Now, Africa. She has a demonstrated interest in human rights leading to her involvement in numerous interventions towards promoting access to justice and gender justice. She has been involved in provision of legal aid services and various advocacy and legislative reform projects. She has served as a member of Kenya’s Attorney General’s Task Force on Implementation of the Sexual Offences Act and the National Steering Committee of the National Legal Aid and Awareness Programme. Ms. Serwanga has undertaken public interest litigation on account of systemic violations of women’s rights and through litigation has sought women’s representation in national leadership institutions and women’s right to health. She is part of the Equality Effect team that undertook (2010-2013) the landmark ‘160 Girls’ litigation project that sought state accountability in cases of sexual violence. Together with Interights UK, she pursued litigation before the African Commission on Human and Peoples’ Rights in pursuit of women’s property rights. To aid litigation and other projects, she has participated in legal research initiatives in collaboration with Georgetown University’s International Women’s Law Clinic, University of California Berkeley, Eqaulity Effect, and Population Council. Ms. Serwanga is certified as a trainer in the National Institute of Trial Advocacy (NITA) ‘learn by doing’ method. She has served as the local coordinator and faculty member of Lawyers Without Borders trial advocacy training programs for Kenyan trial lawyers for Kenyan trial lawyers and prosecutors since 2008. As a member of the Coalition for an Effective African Court, she has trained lawyers on the African human rights systems and public interest litigation in various African countries. Ms. Serwanga holds a Bachelors of Laws (LLB) degree from Makerere University (Uganda), a post graduate diploma in Legal Practice from Kenya School of Law, and a Masters of Law (Human Rights and Democratisation in Africa) degree from University of Pretoria (South Africa). She is certified in provision of Mediation and has recently taken an interest in human rights and the extractive industry. Sheila Muwanga graduated with a Bachelor of Arts in Social Work and Social Administration, specializing in women’s rights. She was touched by the situation of poor and vulnerable people when she was a social worker, and decided to engage in work that would provide them with social and legal support as well as help to give them voice. She volunteered with the Foundation for Human Rights Initiative (FHRI), a leading human rights advocacy organization in Uganda. At FHRI, she worked with the Citizens Advice Bureau, and later as a project coordinator for the Access to Justice Project. She became the Deputy Director (programs) in 2006 and Acting Deputy Executive Director (Programs) in 2013. Outside of her role at the FHRI, she also founded an informal group of friends under an initiative called ‘Spreading Jesus’ Love’, which supports the children of women in Ugandan prisons. Ms. Muwanga has also committed time to supporting a social support centre called, ‘Come Let’s Talk’ which provides pycho-social support to women and children. Currently, she is the Chairperson of the Board of Directors of Human Rights Awareness and Promotional Forum in Uganda (HRAPF). In 2011, Sheila received an award from the Action Group for Human Rights and HIV AIDS (AGHA) for the support she rendered to the group in its formative years as well as her contribution to the fight against discrimination of persons living with HIV/AIDS. Ms. Muwanga was elected Vice-President of FIDH at the 38th FIDH Congress in Istanbul, Turkey, in May 2013. She was nominated by the Foundation for Human Rights Initiative (FHRI) which is a member organisation of FIDH. Bhekinkosi Moyo is the Executive Director of the Southern Africa Trust. He is a renowned writer, author, researcher and thought-leader with keen interest in questions of African resources, democracy and governance. Bheki as he is fondly called, has championed African discourse on philanthropy, contributed to the growth of African civil society formations and has taken part in most of continental processes of development and governance. He has written extensively on African philanthropy, civil society and governance. He was also instrumental in setting up the Dakar base for Trust Africa, where he was the Program Director. Bheki serves on various boards. He is a frequent speaker before the UN, Africa Union, Regional economic communities, international and local media outlets and other world forums on the plight of the poor and what rights accrue to the less privileged, good governance, freedom of association, rights of movement, international justice and accountability and responsibility to Protect. He has led many initiatives in Africa, notably his work on Darfur, South Kordofan and Blue Nile, Northern Uganda, South Sudan, Sudan, Kenya post election violence and attendant quest for justice and campaigning to end the human rights violations in Africa and protection of forced migrants on the continent. Dismas is the Founder and former Director of the International Refugee Rights Initiative (IRRI), based in New York (USA) and Kampala (Uganda) with offices in London and Dakar. He was Africa Coordinator of the International Refugee Program at Human Rights First, USA, where he was responsible for designing, and coordinating and implementing advocacy strategies to enhance refugee protection in Africa. Before joining Human Rights First, Dismas worked as Deputy Country Representative for Africa Humanitarian Action, an African NGO that provides relief to displaced populations across the continent. An award-winning journalist, Dismas worked as reporter and editor for many years for newspapers in Uganda including Weekly Topic, The Monitor, The Crusader, where he covered politics and conflicts in the Great Lakes region, including the 1994 Rwanda genocide. Dismas graduated with a Masters of Arts from the Fletcher School of Law and Diplomacy, Tufts University (2001) and concurrently studied Press, Politics and Public Policy at Kennedy School of Government, Harvard University (2001). He holds a B.A. in Mass Communication from Makerere University, Uganda (1992) and a Certificate in the Study of Refugees and Forced Migration from the University of Dar Es Salaam, Faculty of Law, Tanzania (2000), LLM oil and Gas. He lectures on refugee and displacement in Africa, human rights law, international criminal law, International humanitarian law, good governance and International Justice developments. He regularly speaks about the plight of war victims at the United Nations, the African Union and European Parliament and many international forums. Dismas has written extensively for regional and international publications and is a columnist for The Observer newspaper in Uganda. Dismas serves as board chair of Conscience International, Advisory board member of Strategic Initiative for the Horn of Africa (SIHA-network), International Steering committee on Responsibility to Protect, former Governing Council Member, East African Civil Society Forum (EACSOF), Reproductive Health Network for Africa (RHANA), former board member of Effective African Court on Human and Peoples Rights, board member of Africa CSO Platform on Principled Partnership (ACP) and as well as on the Peace and Security cluster of the Centre for the Citizen Participation with the Africa Union (CCP-AU). He also served as an Advisor to The Nexus Fund. He has consulted and lectured on Civil society; good governance; international justice, rule of law, regional integration, Human rights, Freedom of speech, Refugee law, Transitional Justice, citizenship and belonging and International development systems and the art of doing advocacy in Africa and Internationally.